I think and talk about art making differently than most artists. I believe most people begin learning to draw the wrong way. I don’t focus on “how-to” and technique. There’s plenty of that already on the internet. I focus on philosophy and mindset. I don’t want to teach you how to draw like I do, I want to teach you how to develop and discover the way you draw. I believe everyone can draw, make art, and call themselves artists. Not just those who went to art school or make money from their art. If you make something—if you make art—you’re an artist. I believe an artist’s unique style is their greatest asset. And I believe you can accelerate the path to finding your artistic style by setting up a drawing habit with your sketchbook. The Pillars of Might Could. I write weekly essays on creativity and art making for my email subscribers. These essays explore whatever obstacle or realization is going on in my own life, and are a way for me to process the struggles of making art as well as crystallize and share the solutions I’ve found work best. My flagship course, Sketchbook to Style Boot Camp, is my project-baby that I spend most of my time on. I also teach mini-classes on Skillshare and on the Might Could Studiomates platform. #MightCouldDrawToday, a free drawing challenge hosted on Instagram. Might Could Studiomates, a private community for budding artists who want to learn, discover, and master their art. Right now, this community is only available to students enrolled in Sketchbook to Style. Join the thousands of artists who use my strategies + tools to discover your artistic style and start loving the art you make. 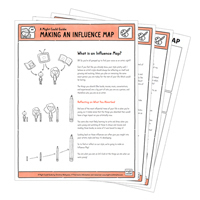 Get my Influence Map Making Guide to find your influences and start uncovering your artistic style!